Ashley Linne loves to write, sing, and travel. She has been writing and leading small group Bible studies for over 15 years and cut her ministry teeth as a collegiate campus minister in her home state of New Mexico. Ashley has a Master of Arts in Family Life Education from the Oxford Graduate School and studied at the Southern Baptist Theological Seminary. She lives with her son in Bellevue, Washington. This study is about our identity in Christ. 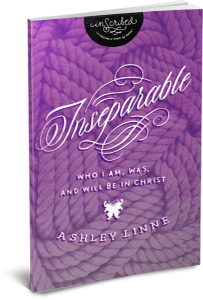 But frankly, when most people see such a topic, they focus on “our identity,” when what matters most is “Christ.” Author Ashley Linne says, “I wondered what it would look like to view myself as a sponge and Jesus as water. Or perhaps to look to him as the wind in my sails and not as a copilot. I think I went through a lot of my life observing Jesus rather than being saturated in him.” Inseparable, based on the book of Romans, encourages us to look to Christ for approval, identity and significance.